She brings together the dough explaining as she goes how a delicate dough like gulab jamun's doesn't require much of kneading. I shake my head, staring out of the window, watching the raindrops slowly slide from the roof. Having heard of 'how to make perfect gulab jamun' lesson before I had given up on ever mastering them. 'I'm not going to bother making them Ammi (mom), I can do with store bought I'm sure' I said. She nodes her head in disagreement, why on earth would anyone want to buy gulab jamun instead of making them. For her, it's a recipe she knows my heart, a thing to be made on whim, the reliable fall back dessert she has mastered over 20 years. These melt in the mouth dumplings are what gets an Indian wedding buffet a 'Shahi' (royal) title. Or any Indian dinner as a matter of fact. Whether it's the Hindu festival of Diwali, Muslim's Eid or marriages, it is dotted in every menu that is something or anything festive. Gulab meaning rose refers to the rose water that is often used in the syrup they are soaked in and Jamun refers to a local plum, which are of similar size. 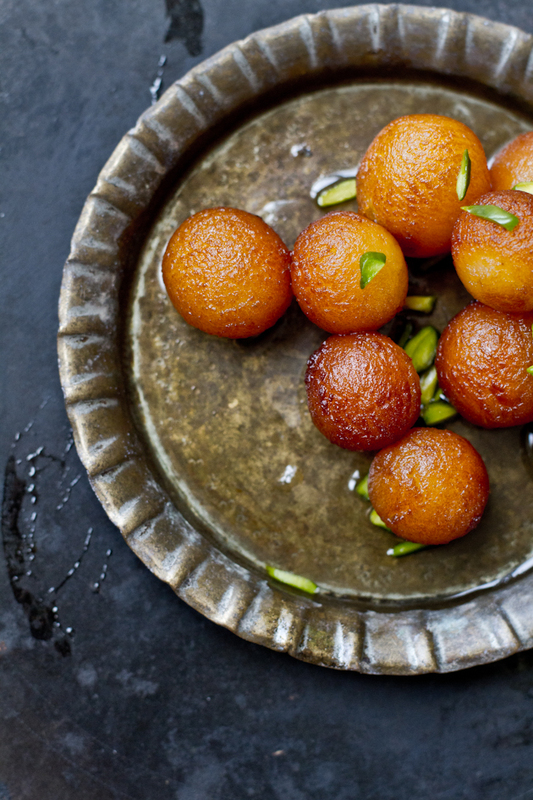 The origins of the gulab jamun though disputed like all great culinary creations, is widely accepted to come from the Persian dumplings called Luqmat Al Kadi. Through out the Arab world there are similar versions of sweet fried dumplings that are soaked in the syrup. The Kuwaiti lugaimat though made with yeast tastes similar. I usually serve them warm with some vanilla ice cream but this rose ice cream just took it to all new level of deliciousness. * Cream lends a richer taste but whole fat milk works as well. The quantity may differ according to brand of milk powder, flour and humidity as well. Start with 1 tbsp of cream/milk at a time until right consistency is achieved. ** Since I served them with rose ice cream I didn't add the rose water in the syrup. If serving on it's own do add it. Mix milk powder, all purpose flour, cardamom and baking powder. Adding one tbsp cream at a time to the dry ingredients and create a soft dough. You want a soft dough which not crumbly. If it is, add another tsp of cream to create a palpable dough. Roll the dough into small balls. I made these mini size by making grape size balls but you could double it. Make the syrup by adding all the ingredients and bringing it to a vigorous boil for 3-4 minutes. The sugar should melt but you don't want to create any consistency. Heat the oil. When the oil is just heated, add the balls. You want to make sure you don't crowd the pan and also that they cook at a really low flame. At first the balls will sink to the bottom of the pan. And then rise up. Sometimes they might just get stuck at the bottom so just lightly scrap them with a spoon and it should come rolling up. Make sure they cook and color evenly on all sides. Cook until golden brown. They should increase in volume and will further swell up in the syrup. As soon as they are out of the oil, put them in the warm syrup. Soak in the syrup for half an hour. If serving later, lightly heat them with the syrup or have them at room temperature. When making the balls make sure there are no cracks on it. Lightly rub the dough between the palm to smoothen it and roll it into a ball again. If the ball still has cracks, you may require more cream to smoothen it further. To deep fry, I recommend using a small (in fact the smallest saucepan) you have so that you don't waste a lot of oil and it is also easier to handle the balls. Add 3-4 at a time depending on the size of the pan. You can use half oil and half ghee for deep frying for a richer taste. Nice girlie. These look as perfect as my mom's. Seriously you are such a perfectionist and I love it about you. & you are right "what are gulab jamums?!" all of the above and none of the above, really. :) Funny thing last summer I was in Nazareth in Israel and saw similar Arab dumplings when I pointed to them the vendor said "it's like Indian Gulab Jamuns." (I saw you mentioned it in your post). In any event I am rambling…. :) btw your mom is right, never buy. Wow, I love everything about this post, it's beautifully written and of course gorgeously photographed. I've never heard of this dessert, but the flavor and texture sounds incredible. Thanks Kulsum! 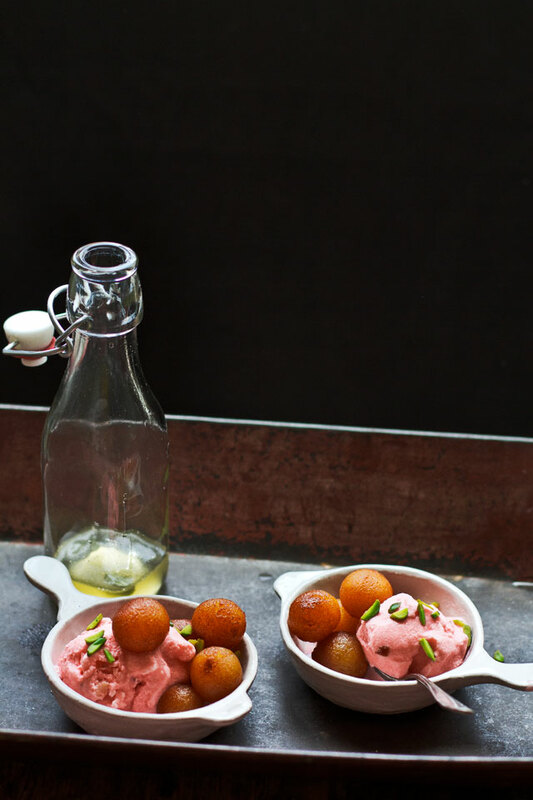 Such a beautiful post Kulsum, my mouth is watering at the sight of gulab jamuns with rose ice cream!! I have always made these with khoya, will give your recipe a try, very very soon!! Those Gulab jamuns look so perfectly done. Love the pictures....they really are making me crave for some right now! Love the vintage feel of your props! The food looks lovely. It sure did, these gulab jamuns with rose icecream took it to a new level. BEAUTIFUL pictures to accompany your perfectly done jamuns. You are a beautiful writer, you know that right? Yes, of course you do! Absolutely decadent. I can almost taste these in my mouth from how good the pictures are. I think it is time you shipped some of these to me. Also your writing in this post is beautiful! That last pic.. I promise you.. is so real I can almost feel myself putting my hand in and taking one off the screen.. hahaa.. seriously!! These look utterly incredible - I can just imagine biting into that crisp, sweet greasiness (in a good way). What a gorgeous recipe. Delicious! 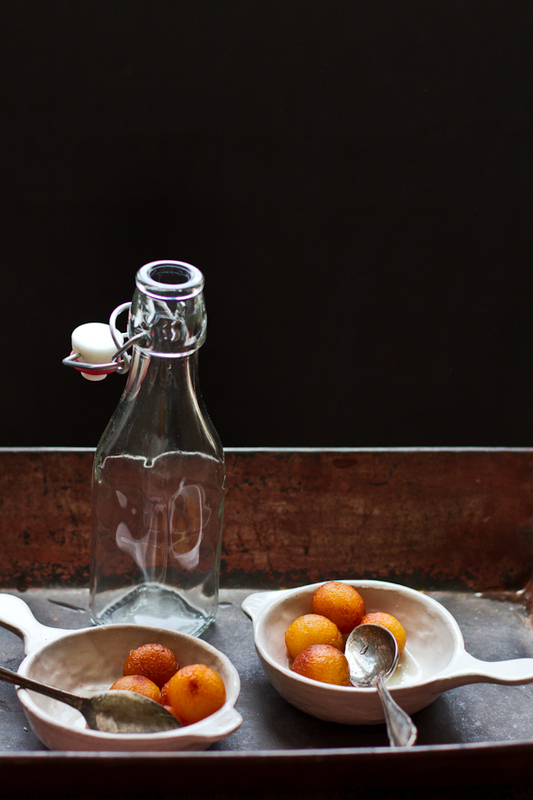 Your bowls, gulab jamun and photographs look delectable. A quintessential welcoming dessert. Beautiful pictures! The idea of rose icecream is exquisite. Sooo perfect! I m just imagining how soft and gooey these would be with rooafza icecream. I made a lot of gulab jamuns after coming here but then I suddenly stopped, I wanna rush to the kitchen and make them again! Oh Kulsum, those gulab jamun look incredible. By the way, I love that plate featured in the last two photos. He ..he..like the nomenclature of humble Gulab Jamun...Deep fried cake/ Yeastless doughtnut holes/Sweet dumplings/Waffle balls....beautiful clicks K! What a beautiful post with gorgeous photography, Kulsum! I'd love to try gulab jamun one day. This is one of my favourite desserts.. I just love the texture and the syrup that goes with it. 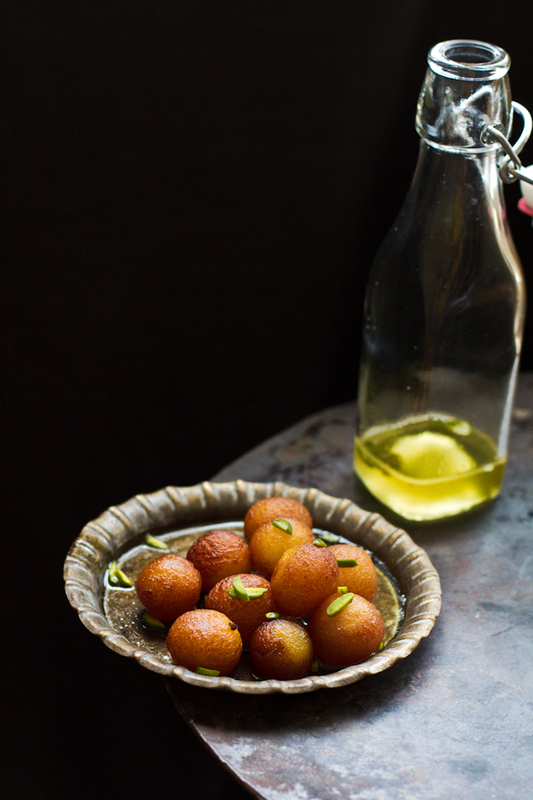 Beautiful photography and gulab jamuns looks like marvelous. Beautiful styling and what a wonderful combination of my two favorite desserts ever :) Pinned! Although Gulab Jamun is one of my favourite recipes and adding rose ice cream with gulab jamun inspires me to do it. Such a lovely publish along with lovely images, Kulthumm! I'd Puppy Training personally want to try out gulag jamun some day. My friend brought these in once many, many, many years ago when I was in jr high and i could never remember the name of this delicious dessert... THANK YOU! My pinterest is awash with rose recipes at the moment, and I also love gulab jamun but have never attempted to make some myself. I can't wait to try this combination out - I have a feeling it will be great!